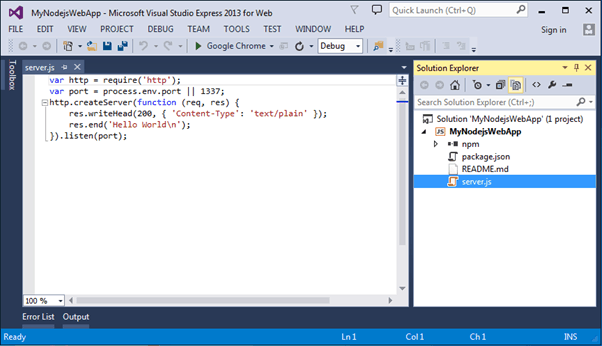 Here, you will learn how to create Node.js web application using Visual Studio. 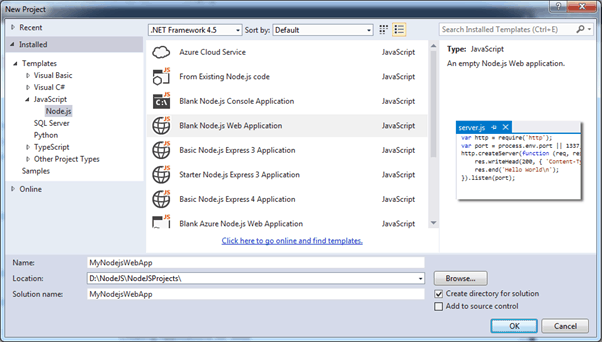 If you have not installed project templates for Node.js in Visual Studio the visit Setup Visual Studio section. First of all, create a new project by clicking on New Project.. on the start page or FILE menu. It will open New Project dialog box as shown below. As you can see, it has created server.js which creates a web server listening on 1337 port and sends Hello World text as a response to any http request. Press F5 to run the web project. It will open command prompt and browser as shown below. So now, you can send different reponses based on the requested URLs the same way as shown in the Node.js web server section.